Sometimes you go on vacation, and a monkey grabs your camera. And sometimes a monkey takes a selfie. 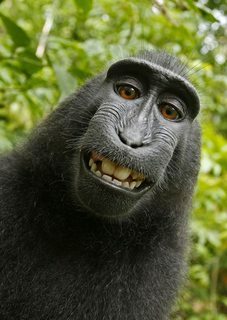 If a monkey takes a selfie, the photo will probably end up in the public domain. And the owner of the camera might protest. It’s a sticky situation. The moral to this story? Don’t let a monkey sneak off with your camera. And always, always, make sure you have permission to use an image. I had a question this week about the circumstances under which mug shots are in the public domain. Generally speaking, all federal mug shots are released to the public. So are state mug shots, excepting some cases where privacy is a concern. New Media Rights gives more detail about what qualifies mug shots for public domain. The design site, 99 designs has compiled a list of resources where bloggers and designers can find images in the public domain. Take the list with a grain of salt–it has a broad array or resources, including sites like Flickr and Wikimedia Commons. I use these on occasion, but be choosy. My alma mater, The University of South Carolina has a list of resources for government images in the public domain. Be vigilant here. In some cases, you will still need to check for copyright issues. Because copyright issues can be so complex, it’s always a good idea to check the copyrights before using an image unless you’re sure you have permission to use it. Stealing is bad. Unless you’re a primate, who stole a camera and can’t claim ownership of its selfie. And if it can’t own its selfie, chances are it will steal your camera and take another selfie.